How do you rekey a door lock? 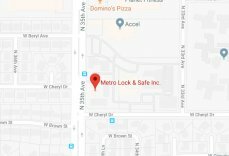 | Metro Lock & Safe Inc.
How do you rekey a door lock? 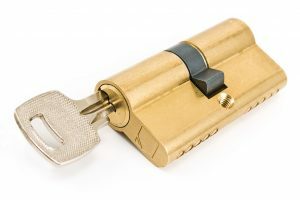 Can I rekey a door lock? Tools you’ll want to have on-hand. A retainer ring removal tool. A cylinder plug removal tool or proper diameter dowel. A set of fine tweezers. The first step is removal of your door knob. You’ll want to make sure that your doorknob is unlocked first. Put in the key and turn the lock to unlock the door. Locate the doorknob clip hole in between the knob handle and the base of the base. This small hole provides access to a clip that keeps the door handle in place. Push your piece of wire into the hole to depress the clip. Then pull the door knob back and off of the door. Remove the knob cylinder next. The cylinder is housed inside of the door knob. You’ll want to push on the lock from the front to push the lock cylinder housing out of the back. There may be a knob sleeve keeping the cylinder in place. This should pop off as you remove the cylinder. After that it’s time for retainer ring removal. The retainer ring keeps the cylinder plug from falling out of the cylinder. The plug is what contains the pins. Push the supplied retainer ring removal tool on top of the ring. This should force the ring from the cylinder. You’ll want to save the ring so you can use it to match a replacement. This is the most important step. The top of the cylinder plug keeps the pressure on the lower pins by using upper pin and springs. The photo to the right will show you the insides of the upper portion of the lock. Make sure you have constant pressure when pushing the cylinder plug out of the cylinder using your dowel or plug removal tool. Think of it as creating a continuum of the plug using the dowel or plug removal tool. The tool or dowel are replacing the plug and maintaining the pressure on the upper pins and springs. You’ll want to leave the dowel/removal tool in the cylinder while you work on the plug and reassemble it in reverse to maintain pressure. Remove the old pins in the cylinder plug. You can dump them out. In a kit the pins will be color coded. Just match the placement to that of the sheet. This is where your tweezers will come in handy. Using a semi-professional kit will require you to cut new keys afterwards. 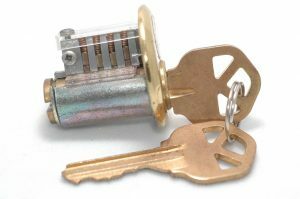 In this case you’ll want to bring your old key and new pin dimensions/order of pins to have new keys created. Just follow these instructions in reverse to reassemble your door lock. 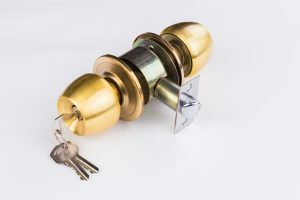 If all of this seems too complicated or you want the security of a professional kit with nearly unlimited locking pin combinations, you’ll want to call a locksmith in the Phoenix area.